"It was a long distance miracle!" My cat Cosmo had been de-clawed already when we got him, but we let him go outside anyway. Occasionally he got scratches on his face, but nothing terribly serious. One evening we returned from being out of town for the weekend and found Cosmo nearly at death's door. He barely moved, his fur was as heavy as a rug and his face was full of puncture wounds plus a huge swollen area on the left side of his face. I was pretty sure he would not make it, so instead of calling the docor I called Amy for help. She worked on him several times long distance and although he was pretty desperately ill, I could see that he started getting better right away. He got up and ate then slept a lot. The wound started draining and and we washed it several times a day. Within a few days I knew he would be alright! We figured it was a mamma possum that attacked him as we saw a baby possum near the back of our house. He is perfectly well today! Thanks, Amy, from Cosmo and all of us." "I have received a lot of BodyTalk treatments from many practitioners, but some of the most profound have definitely come from Amy Freund. In a recent session she removed chronic neck pain that I had been living with for almost 15 years. In one amazing treatment all those years of pain and reduced range of movement simply vanished! Thank you Amy!" "I have to tell you that I hadn't realized until yesterday that I am going through a complete transformation right now. I have been going through this transformation for the last 2 years on all different levels in my life and within myself. The past 2 years have been about changing the external aspects of my life like friends, career, finances, self esteem and respect, boyfriends, etc. However, the aspect of transformation I just began going through is the most important so far. This aspect is changing me, the real essence of me. And this is totally internal. And the funny part is, people around me are noticing it externally. When I came into work on Mnday my best friend and co-worker told me that my aura and energy were different like I was a new person. My sister asked me last night when did this change begin and after thinking about it for a few moments, I realized it all began when I made the decision to do Bodytalk. You said that my body needed to do some balancing work within me. Well the one aspect of myself that has always been unbalanced is the energy I give to myself. I am constantly giving to others and rarely taking time to give to myself. And ever since my session with you I have been giving to myself every day without becoming unbalanced in that direction. I am still giving to others and taking care of my responsibilities. So, as you can see, as the days go by I am noticing more and more how my BodyTalk session with you is affecting me. I want to thank you again and I will ldefinitely be back. My sister wants to do a session also! "I would like to thank you Amy for the work you did on my daughter in law in her hour of need. I found you very professional, intuitive and discrete. You have a pleasant friendly approach that is so easy to work with and your treatments are effective but non intrusive. I will be recommending you to many of my friends". 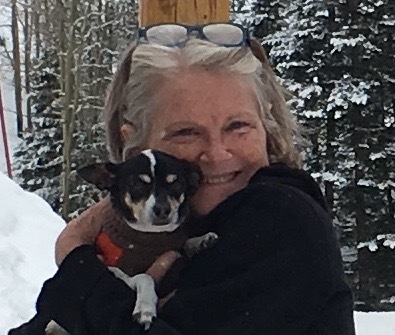 "I would like to thank Amy for the care and thoughtfulness that she exhibited when performing a distance BodyTalk session for my friend's dog, Chicklet, whom I was babysitting. Little Chicklet was afraid of her own shadow. She was very nervous in our home in a new environment. Extremely frightened of my husband. By the end of her week staying with us she was greeting him at the door when he arrived home from work. Chicklet continues to improve in her own environment, after many years of non improvement this is a significant change in her behavior." "Amy Freund is a kind, compassionate healer who is skilled in many healing modalities. Whenever we have worked together, regardless of whether the work was in person or from a distance, she was always totally committed to helping me and I always felt a positive change and saw an improvement". "You are the most amazing person I have ever met. From the moment Cookie brought H and myself to your office almost a year ago, right up to this very second, I was blown away by your phenomenal ability to "body talk". What you brought up to both H and myself was truly extraordinary. H said that he would love to come back and see you if we ever get back to Florida. I can never forget our wonderful talk when you offered me more loving and wonderful advice prior to my returning to Jamaica. "Amy works magic with her intuitive skills and her compassion!" For the life of me, I do not know and I am not totally sure I want to know. I became a client or recipient of a new to me method of healing. I have witnessed many forms of healing in my life time of 48 years and each method has had me travel from A to Z in every conceivable mode. I began working with Amy and BodyTalk after meeting her at a BodyTalk ACCESS workshop which I attended with a friend. I am absolutely amazed by the fact that I can go in and Amy touches my body (arm), we relax and from that point we both drop all of our barriers and my body responds. I think I am in pretty good touch with my mental, physical spiritual as well as emotional needs. Every time I have had a session with Amy, no matter what has been going on in my life, she is able to zero in and a healing can take place. I have such bizarre things from toothaches, hurt muscles to emotional withdrawing and each time there has been an almost instant healing after Amy and I have worked together. I would recommend BodyTalk to anyone even if you just feel slightly off and are interested in realigning your energetic field. It is a pleasure to have the experience and to work with Amy. "I am very thankful to Amy for all of the good energy she transmits in her work. She is dedicated and gives you 100% in each session. After each session my soul feels lighter. My fear levels are substantially lower now. She is a good listener and devotes a good amount of time with each patient. I am fascinated by her and BodyTalk. I would highly recommend Amy. BodyTalk has made a difference in my life. "I have known Amy for several years as a friend and have always been impressed by her dedication to help others in any way she can, particularly in the field of alternative healing. After her successful attempts to rid me of a problem I have had for many years I can personally vouch for her ability to heal using BodyTalk and would recommend her to all of those who, intuitively, consider that she can help with their problems." "Amy has a gentle and caring approach. BodyTalk helped to make sense of some emotional feelings that had been bottled up and manifested into some physical ailments. Very deep stuff - I recommend going into it with an open mind - you will be surprised at the messages that surface. Most important, be patient any time you are treating the body as a whole as it takes a bit longer. The best of luck!" "I am very scared of the dentist and I knew I had to go and get a filling, so I asked Amy if she could help me with the fear and the overall experience of the dentist. After the BodyTalk session with Amy, I was shocked at how well the dentist went. It was the best experience I have had there! it was so fast and painless and the dentist even said that the cavity was smaller than he thought!" "I had an ulcer in my eye and received a healing session from Amy. It healed so well and the eye doctor was so shocked at how it healed. He said that it healed about 10 times faster than he's ever seen an ulcer heal before! Thank you Amy." "My one year old daughter was miserable with a fever and hadn't slept well for two days. She woke up several times during the night and didn't nap for more than 20 minutes - and she's normally a deep sleeper. She was waking up screaming in pain and was also having trouble walking. I asked Amy to do a distance session on her and the night she did, my baby slept all night and late the next morning. When she woke up she played with her stuffed toys for a while and was happy for at least 15 minutes after waking up. Amy said the session revealed fear trapped in her legs - specifically from a cat fight. We just happened to be staying at a friend's house who had cats and there was a fight right oustide her bedroom door during the night while she was sleeping, the night before she got sick and started falling down a lot. I was very happy that she was feeling better and ABSOLUTELY AMAZED that Amy was able to pick up on the cat fight!". "A BodyTalk session with Amy Freund is one of the best gifts one can experience. The depth and accuracy is astounding...and I feel renewed and revitalized. Lighter too. And for sure will be going back again!" "After only one session with Amy, she was able to reveal blocked emotionas from 25 years ago, and was able to inform me of present day issues that she proceeded to balance me for. I was quite amazed!" Copyright, 2007, amyfreundBODYTALK. All rights reserved.